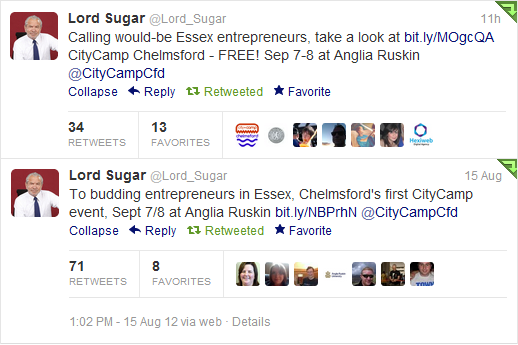 City Camp Chelmsford is coming – book now! Tickets are selling well this week. It’s already looking to be a really good event with attendees from local government, police, business and entrepreneurs. A boost in interest was largely due to the generous help of Lord Alan Sugar courtesy of two tweets to his 2.2 million followers. We’ve also got posters and banners up in the city centre, including some vertical banners. Look out for flyers which we’ll be giving out in the High Street this week and also some fantastic minicards.